Goals from Hope Akpan and Danny Graham sealed victory for Blackburn Rovers against Middlesbrough, who missed the chance to go top of the Championship. Boro, who needed a point, were undone by a deep cross to the back post that Akpan nodded in early after the break. Graham made it four goals in four games against Boro when he took in Simeon Jackson's flick-on and smashed in. Adam Forshaw's late goal gave the Teessiders hope in injury time, but it came too late to rescue a point. Home goalkeeper Jason Steele denied striker Jordan Rhodes three times in one-on-one situations, as the two came up against their respective former clubs. Scotland international Rhodes and Ritchie De Laet both had penalty claims as Boro pressed, but they were waved away by referee Andrew Madley. Rovers' second win in a row moves them up to 16th in the table, and they might have enjoyed a more comfortable finish had Matt Grimes turned in two half-chances. Defeat for Aitor Karanka's visitors, who stay third, was compounded by the loss of captain Grant Leadbitter to a hamstring injury in the second half. "They're a top side. What happens when you see the finishing line, to try and get out, sometimes nerves come into it. Whether that happens to them again, I don't know. "You'd like to think they will see it through this time because of the disappointment of last year. "You will tend to find between now and the end of the season it will be pretty twitchy." "It's taken 75-85 for us minutes to wake up. It's really difficult for me to understand why a team like Blackburn, who is in the middle of the table and which had played five games in the last two weeks, and their players wanted it more than us. Their players are jumping more than us, they were quicker than us, even when they were winning 2-0 they were desiring to score the third one. "When we are playing to get promotion, or at least to be in the play-offs, it is difficult to understand." 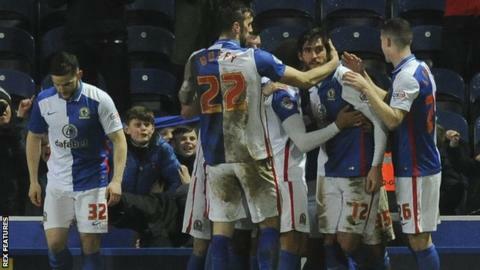 Match ends, Blackburn Rovers 2, Middlesbrough 1. Second Half ends, Blackburn Rovers 2, Middlesbrough 1. Attempt missed. Adam Clayton (Middlesbrough) right footed shot from outside the box misses to the right. Simeon Jackson (Blackburn Rovers) is shown the yellow card for hand ball. Gastón Ramírez (Middlesbrough) wins a free kick in the defensive half. Goal! Blackburn Rovers 2, Middlesbrough 1. Adam Forshaw (Middlesbrough) right footed shot from outside the box to the bottom left corner. Assisted by Gastón Ramírez. Attempt missed. Ritchie de Laet (Middlesbrough) right footed shot from the centre of the box misses to the right. Assisted by Adam Forshaw with a headed pass. Substitution, Middlesbrough. Cristhian Stuani replaces David Nugent. Goal! Blackburn Rovers 2, Middlesbrough 0. Danny Graham (Blackburn Rovers) right footed shot from the centre of the box to the bottom left corner. Assisted by Simeon Jackson with a headed pass. Substitution, Blackburn Rovers. Craig Conway replaces Matt Grimes. Attempt blocked. Elliott Bennett (Blackburn Rovers) right footed shot from outside the box is blocked. Attempt saved. Jordan Rhodes (Middlesbrough) right footed shot from the right side of the box is saved in the bottom right corner. Offside, Blackburn Rovers. Jason Steele tries a through ball, but Simeon Jackson is caught offside. Substitution, Blackburn Rovers. Elliott Bennett replaces Jordi Gómez. Delay in match Matt Grimes (Blackburn Rovers) because of an injury. Jordan Rhodes (Middlesbrough) wins a free kick in the attacking half. Corner, Middlesbrough. Conceded by Grant Hanley. Attempt missed. Dael Fry (Middlesbrough) right footed shot from the left side of the six yard box misses to the left. Assisted by Gastón Ramírez with a cross following a corner. Gastón Ramírez (Middlesbrough) wins a free kick in the attacking half. Corner, Middlesbrough. Conceded by Matt Grimes. Attempt blocked. David Nugent (Middlesbrough) right footed shot from the left side of the box is blocked. Assisted by Gastón Ramírez. Attempt missed. Matt Grimes (Blackburn Rovers) right footed shot from outside the box is high and wide to the right. Substitution, Blackburn Rovers. Simeon Jackson replaces Tony Watt. Attempt missed. Matt Grimes (Blackburn Rovers) left footed shot from outside the box misses to the right. Assisted by Tony Watt with a headed pass.